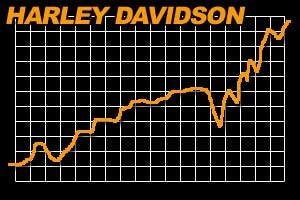 Harley-Davidson, Inc. announced record revenue and earnings for its first quarter ended March 27, 2005. Revenue for the quarter was $1.24 billion compared with $1.17 billion in the year-ago quarter, a 6.0 percent increase. First quarter diluted earnings per share (EPS) were 77 cents, a 13.2 percent increase compared with last year’s 68 cents. First quarter revenue from Harley-Davidson® motorcycles was $979.0 million, an increase of 6.5 percent over the first quarter last year. Shipments of Harley-Davidson motorcycles totaled 76,716 units, up 2,626 units or 3.5 percent over last year. First quarter revenue from Parts and Accessories (P&A), which consists of Genuine Motor Parts™ and Genuine Motor Accessories™, totaled $176.9 million, a 4.6 percent increase over the year-ago quarter. For the longer term, the Company expects P&A revenue to grow at a rate slightly faster than the motorcycle unit growth rate. General Merchandise revenue, which consists of MotorClothes® apparel and collectibles, was $59.5 million in the first quarter, up 9.3 percent over the same period last year. For the longer term, the Company expects General Merchandise revenue to grow at a rate lower than the motorcycle unit growth rate. First quarter gross margin for the Motorcycles and Related Products Segment was 37.6 percent of revenue, approximately the same as the year-ago quarter of 37.8 percent. Gross margin was negatively impacted by higher material costs, primarily metal surcharges; it benefited from favorable foreign currency exchange. Operating margin grew to 24.2 percent from 22.9 percent due to lower operating expenses. In the United States through March, Harley-Davidson retail motorcycle sales finished down approximately one percent compared to 2004. Similarly, the U. S. heavyweight motorcycle market declined 0.4 percent in the first quarter. Worldwide retail sales of Harley-Davidson motorcycles grew 2.8 percent for the quarter, driven by strong performance in Europe and Japan, which increased 20.6 and 10.6 percent respectively. On an industry-wide basis through February 2005, the 651+cc segment grew slightly in Europe, while the heavyweight market in Japan was down for the same period. Data is listed in the accompanying tables. Harley-Davidson Financial Services (HDFS) reported operating income of $53.6 million, up $3.3 million or 6.5 percent compared to the year-ago quarter. HDFS continued to experience strong customer acceptance of its financial products. During the quarter, HDFS sold $730 million in retail motorcycle loans and recorded a gain of $19.2 million. This compares with a gain of $25.2 million on $625 million of loans securitized during the first quarter of 2004. The gain of 2.6 percent as a percentage of loans sold is slightly above management’s guidance which is now 1.7 to 2.5 percent in the current interest rate environment. Annualized credit losses on a managed portfolio basis increased during the quarter to 1.07 percent in 2005 from 0.77 percent in 2004 due to the combination of a higher incidence of losses and lower recovery rates. HDFS is maintaining its credit loss target of 1 percent or less of managed receivables. In 2005, HDFS operating income is expected to be slightly lower than that achieved in 2004 primarily due to a highly competitive marketplace and an increasing interest rate environment. For the longer term, the Company expects the HDFS operating income growth rate to be slightly higher than the Company’s motorcycle unit growth rate. On January 1, 2005 the Company adopted new accounting rules requiring it to recognize expense related to the fair value of its employee stock option awards. Total stock compensation expense recognized by the Company during the first quarter of 2005 was $7.0 million. Operations generated cash of $51.7 million during the first quarter of 2005 compared to $161.2 million during last year’s first quarter. During the first quarter of 2005, the Company made a voluntary cash contribution of $102.3 million to post-retirement health care trusts to pre-fund retiree benefits. This contribution allows the investment earnings to grow tax free within the trusts. Harley-Davidson is revising its previous guidance and now plans to ship 329,000 Harley-Davidson motorcycles in 2005. This 329,000 unit target represents a 3.7 percent growth rate over 2004 shipments. The Company believes that this 10,000 unit reduction will occur almost entirely in the second quarter and will involve reducing planned production of 2005 Model Year motorcycles. Revised quarterly shipments are expected to be as follows: 77,000 units in the second quarter, 87,500 units in the third quarter and 87,500 units in the fourth quarter. Harley-Davidson, Inc. is the parent company for the group of companies doing business as Harley-Davidson Motor Company, Buell Motorcycle Company and Harley-Davidson Financial Services. Harley-Davidson Motor Company, the only major U.S.-based motorcycle manufacturer, produces heavyweight motorcycles and offers a complete line of motorcycle parts, accessories, apparel, and general merchandise. Buell Motorcycle Company produces sport motorcycles. Harley-Davidson Financial Services provides wholesale and retail financing and insurance programs to Harley-Davidson dealers and customers.